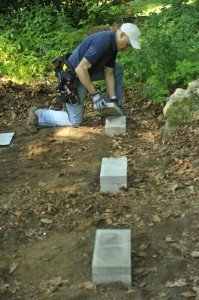 For the past 30 years, I’ve written extensively about DIY home remodeling and repairs, woodworking projects, and tool techniques. And of all the various subjects I’ve covered, none draws greater interest than backyard storage sheds. In fact, I’ve become somewhat of an expert on sheds. I’ve designed and constructed nearly 20 backyard buildings, written more than two dozen magazines articles about sheds, and recently published my third shed-building book. So, it’s not surprising that people often ask me for advice about building their own backyard storage shed. The questions are typically about what size or style of shed to build, but it’s much more important to focus on the proper construction techniques and building materials. Below are my top six rules for building a durable, structurally sound, weather-resistant shed that will last for generations. Maintain the setback distances suggested by your town’s building department. Outbuildings typically must be 10 ft. from the rear property line, and 15 ft. from the side-lot line. However, building codes vary from state to state, even from town to town, so check with the building inspector for the setback distances in your town. Never build a shed at the bottom of a hill or in a low-lying area that collects water. The constant exposure to moisture will rot wood, blister paint, rust hardware and hinges, and cause mold and mildew to grow on items stored inside. And if the ground remains wet, it can erode the soil and upset the foundation. Also avoid building in a completely shady area. 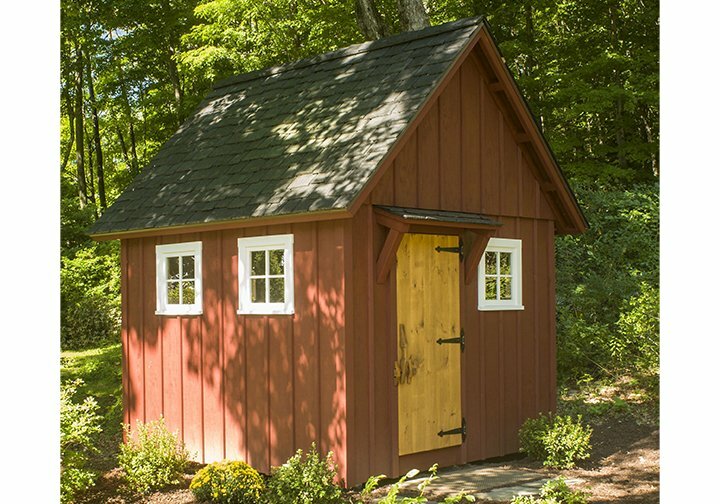 Exposure to direct sunlight and breezes will help keep the shed dry and free of rot and mold. If your yard slopes slightly, position the front of the shed (the side with the primary door) on the high side, so that the property slopes down toward the rear. That’ll make it much easier to step into the shed because the door’s threshold will be closer to the ground. Finally, don’t build in the farthest, back corner of the yard. The shed might look nice way back there, but it’s inconvenient having to traipse back and forth across the yard to reach the shed. Build it closer to the house or garage, and everyone will be much more likely to return items to the shed. Most sheds can be supported by an on-grade foundation, which consists of solid-concrete blocks or pressure-treated wood timbers set directly on the ground. The concrete blocks or timbers (skids) are leveled and spaced close enough together to properly support the shed’s floor frame. Solid-concrete blocks, laid out in straight, parallel rows, can be used to build on-grade foundations. Larger sheds, those typically over 200 sq. ft., require permanent foundations that extend down to the frost line. They’re usually constructed of poured-concrete piers or buried wooden posts. Again, check with the building department for specific code requirements and frost-line depth in your area. If using buried wood posts or on-grade timbers, be sure to cut them from pressure-treated lumber rated for “ground contact.” Treated wood rated for “above-ground” use isn’t intended for burial or direct contact with the ground. Water is wood’s worst enemy. Given the right circumstance and enough time, excessive moisture can ruin the strongest, best-built shed. Fortunately, there’s an easy remedy. First, be sure that the lowest wood member—the mudsill—is at least 6 in. above grade. That elevates the shed high enough off the ground to allow fresh air to circulate under the floor frame. Also, leave at least 3 ft. of air space around all sides of the shed. Building too close to trees, shrubs, fences and other structures will block sunlight and wind that help keep a shed dry. Plus, having a clearance space around the shed makes it much easier when it comes time to paint or make repairs. Because a shed’s floor frame and plywood floor deck are closest to the ground, they’re most susceptible to moisture-related problems, such as rot and mold. That’s why it’s so important to use the proper building materials. When building the floor frame, which consists of the mudsill, floor joists and perimeter band joists, use 2×6 or 2×8 pressure-treated lumber, which is resistant to moisture and wood-boring bugs. 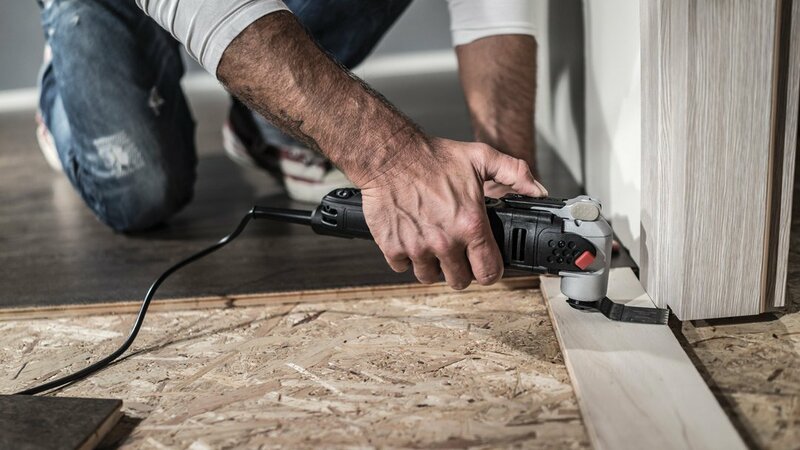 Never use untreated or standard construction-grade lumber to build the floor frame. 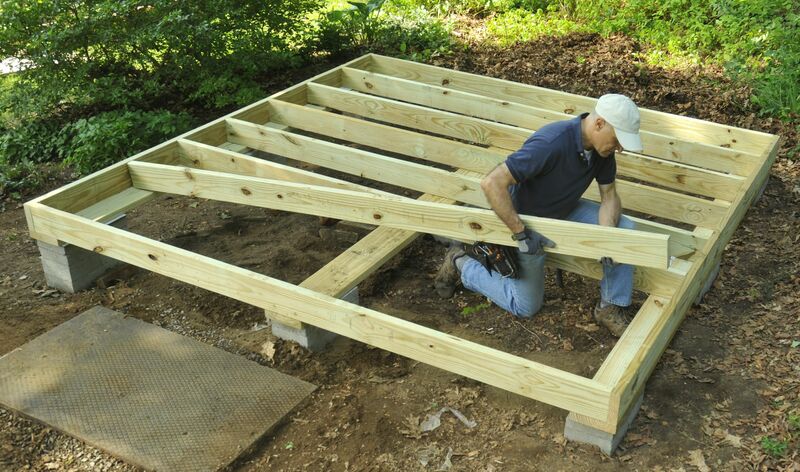 Build the shed’s entire floor frame out of weather-resistant pressure-treated lumber. For the shed’s floor deck, use ¾-in. exterior-grade plywood; anything thinner will flex between joists. (A double layer of ½-in.-thick exterior ply can be used as well.) In areas with excessively high moisture—such as Florida, Alabama and the other Gulf Coast states—consider using pressure-treated plywood for the floor deck. It’s particular resistant to moisture and insects. And if you plan to store heavy items, such as a lawn tractors or woodworking machines, install ¾-in. tongue-and-groove plywood. Its edges lock tightly together creating a rock-solid, rigid floor. Most of us barely have enough time to maintain our homes, which is why it’s smart to choose low-maintenance materials for your shed. You’ll have to pay extra for these all-weather materials, but they’ll save you time and trouble in the long run. 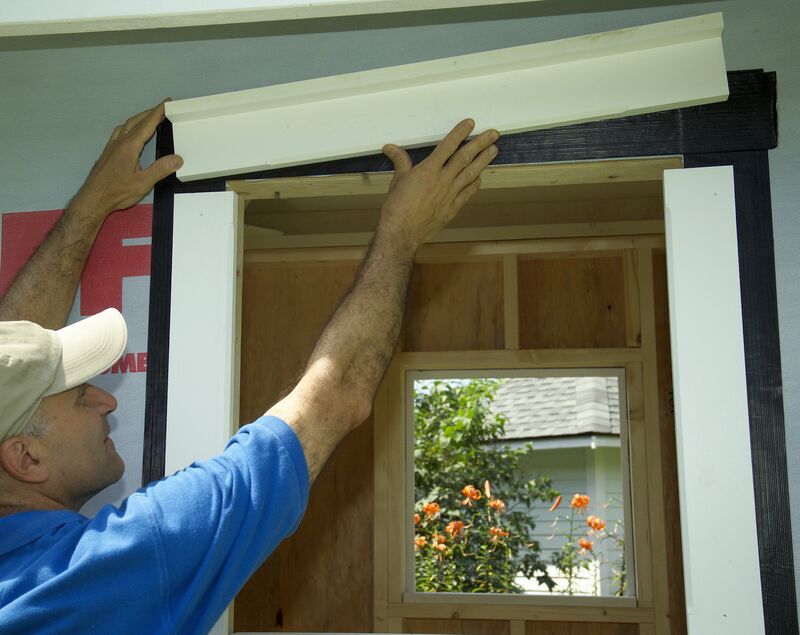 For example, cut the shed’s exterior trim from PVC boards, instead of painted wood. The plastic lumber is ideal for the rake board, fascia, frieze, corner boards, and window and door trim. PVC is impervious to bugs, warping, splitting or decay, and it never needs painting. Trim windows with rot-proof PVC boards, which don’t require painting, scraping or sanding. Other low-maintenance options include: vinyl or aluminum windows, faux slate roof shingles, fiberglass or steel doors, composite decking for steps, and fiber-cement siding or vinyl siding. Most DIY shed builders give very little forethought to the shed’s doors, which is a mistake: There’s no sense in building a shed to store a particular item, such as a lawn tractor, if you can’t fit it through the door. The two types of doors most commonly used on outbuildings are hinged and sliding, and both work well. Hinged doors take up less space and close more tightly and securely. Sliding doors are easier to install and they glide completely out of the way. Also, sliding doors work well in areas that receive a significant amount of snow; out-swinging doors can be blocked by snow. On the downside, sliding doors require additional wall space to slide over when opened. Door placement is also important. Doors are often placed on the gable-end of the building, which looks nice, but makes it difficult to reach items stored at the rear of the shed. A better alternative is to put the door on the long sidewall, so that you’ll be able to access items to the right, left and back. 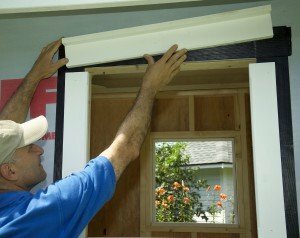 Another option is to install doors on each gable-end wall, so that you’ll be able to easily gain access from either end of the shed.